VLONGERON PI Film Laminated Product This plate material is formed by thermocompression bonding and laminating PI film. Please contact us for more information about applications and manufacturing dimensions. VF-10 VALQUAFOIL Ring Packing Ring packing molded with expanded graphite powder or tape using tooling for specified dimensions. Available in standard, quick removal and lubricant-treated types. Used as a stem seal for valves against water, steam, oil, acid, alkali, heat medium, solvent and gas (except oxygen, oxidizer, oxidized acid) applications. Usually used in combination with adapter packings such as No.VFC-25 and 6399L. VF-20 VF Braid No.VF-20 is a coil packing made of expanded graphite yarn reinforced with Inconel wire and braided into a square cross-section. No.VF-20L and VF-20LF are of low-torque type treated with lubricating oil and special unification treatment, respectively. No.VF-20LAE is also available for nuclear valves. Used as a stem seal for valves against water, steam, oil, acid, alkali, heat medium, solvent and gas (except oxygen, oxidizer, oxidized acid) applications. Usually used in combination with adapter packings such as No.VFC-25 and 6399L. VF-20L VF Braid No.VF-20 is a coil packing made of expanded graphite yarn reinforced with Inconel wire and braided into a square cross-section. No.VF-20L and VF-20LF are of low-torque type treated with lubricating oil and special unification treatment, respectively. No.VF-20LAE is also available for nuclear valves. Used as a stem seal for valves against water, steam, oil, acid, alkali, heat medium, solvent and gas (except oxygen, oxidizer, oxidized acid) applications. Usually used in combination with adapter packings such as No.VFC-25 and 6399L. VF-20LF VF Braid No.VF-20 is a coil packing made of expanded graphite yarn reinforced with Inconel wire and braided into a square cross-section. No.VF-20L and VF-20LF are of low-torque type treated with lubricating oil and special unification treatment, respectively. No.VF-20LAE is also available for nuclear valves. Used as a stem seal for valves against water, steam, oil, acid, alkali, heat medium, solvent and gas (except oxygen, oxidizer, oxidized acid) applications. Usually used in combination with adapter packings such as No.VFC-25 and 6399L. VF-22 VF Braid No.VF-22 is a coil packing made of expanded graphite yarn braided into a square cross-section. Used as a stem seal for valves and a shaft for pumps, rotary and reciprocating equipment against water, steam, oil, acid, alkali, heat medium, solvent and gas (except oxygen, oxidizer, oxidized acid) applications. Used in combination with adapter packings such as No.6345 and 1110 for reciprocating and high-pressure applications. VF-30 VALQUAFOIL Gasket expanded graphite sheet, processed into specified flat shape Used as gasket for pipe flange handling penetrative liquid, such as thermal oil, extremely low temperature such as, LNG and liquid nitrogen, or corrosive liquid, and also for level gauge, valve bonnet, and other various equipment. VF-30 for low pressure, VF-35E for high pressure. 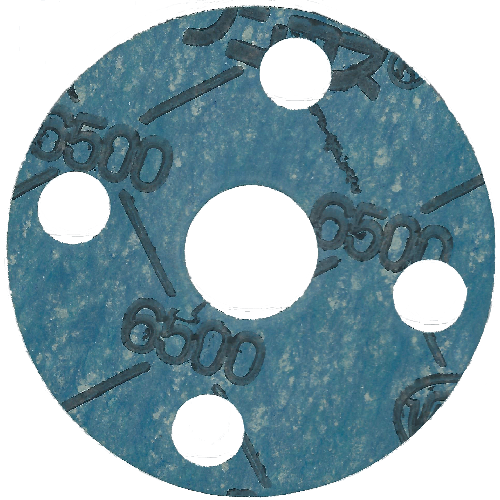 VF-35E VALQUAFOIL Gasket with thin metallic sheet Stainless steel sheet, with expanded graphite applied to both sides, processed into a specified flat shape Used as gasket for pipe flange handling penetrative liquid, such as thermal oil, extremely low temperature such as, LNG and liquid nitrogen, or corrosive liquid, and also for level gauge, valve bonnet, and other various equipment. VF-30 for low pressure, VF-35E for high pressure. VFC-25 Carbon Fiber Reinforced VF Braid No.VFC-25 is a coil packing made of expanded graphite yarn reinforced with carbon fiber and Inconel wire, braided into a square cross-section and processed with special lubrication treatment. No.VFC-25 is used as a stem seal for valves and an adapter for No.VF-10 and VF-20 (Packing for adapters only). VFT-22 PTFE-cladded VF Braid No.VFT-22 is a coil packing made of expanded graphite yarn reinforced with carbon fiber and Inconel wire, braided into a square cross-section and processed with special lubrication treatment. It is a gland packing that makes full use of the characteristics of each material. Used as a stem seal for valves against water, steam, oil, acid, alkali, heat medium, solvent and gas (except oxygen, oxidizer, oxidized acid) applications. VFX-15 VF Braid Reinforced by Metal Wire No.VFX-15 is a coil packing formed by reinforcing expanded graphite yarn using thin metallic wire, braiding it into a square-shaped cross section, and then applying lubricant. No.VFX-15 can be used individually as a valve shaft seal for general purpose applications. VP4640 Fluoritz-SB Fluoritz SB, a perfluoroelastomer, formed with O-shaped cross-section (black). Extremely excellent resistance to chemicals. Used in areas requiring high resistance to chemicals for semiconductor, liquid crystal, chemical and electric/electronic industries. VPH4640 Fluoritz-HR Fluoritz HR, a perfluoroelastomer, formed with O-shaped cross-section (black). Extremely excellent resistance to chemicals as well as heat. Used in areas requiring high thermal resistance for semiconductor and liquid crystal equipment (PE-CVD, LP-CVD and diffusion furnace) and in automobile, chemical and energy sectors. VPHS4640 FLUORITZ-HS This dark brown product, exclusively made for thermal diffusion processes in semiconductor manufacturing equipment, is formed by molding FLUORITZ-HS, a perfluoroelastomer material, into a ring shape with an O-shaped cross section. It has the best heat-resisting properties in the FLUORITZ series and also has excellent radical resistance, purity, and low distortion characteristics. It is used in the areas where heat-resisting properties are required within thermal diffusion devices of semiconductor manufacturing equipment. VPT4640 FLUORITZ-T20 This black product is formed by molding FLUORITZ-T20, a perfluoroelastomer material, into a ring shape with an O-shaped cross section. It maintains high radical resistance, and has excellent purity, low distortion characteristics, heat-resisting properties, and sealability for moving parts. It is used inside gate areas of dry-etching/ashing systems or CVD systems in semiconductors and LCD equipment that require high radical resistance. VPTR4640 FLUORITZ-TR This product is formed by molding FLUORITZ-TR, a perfluoroelastomer material, into a ring shape with an O-shaped cross section. It maintains high radical resistance, and has excellent purity, low distortion characteristics, and heat-resisting properties. It is used inside locations of dry-etching/ashing systems or CVD systems in semiconductors and LCD equipment that require high radical resistance. （VS1） Mechanical Seal Mechanical seal for rotating parts of pumps and other industrial equipment. The products are available in two types (E and R), which differ each other in seat ring bonding method is different, but are identical in rotary unit.